White Siberian cannabis seeds by Dinafem Seeds belong to an Indica-dominant, feminized cannabis strain that originates from the cross of a White Widow and an AK-47. The result is a powerful, hardy hybrid with remarkable medicinal effects. 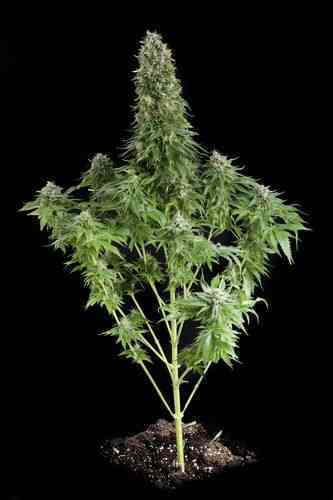 White Siberian cannabis seeds are aimed at those seeking powerful Indica properties. It is an easy to grow, vigorous marijuana plant that flowers fast and produces dense, compact buds with amazing amounts of resin. Indica lovers will definitely enjoy this hardy all-rounder. White Siberian cannabis seed produces medium-sized plants that perform well indoors and under a dry, warm, sunny climate or in the greenhouse. Its high resin production and its potency are a reflection of its noble parentage. White Siberian cannabis strain gives off a strong aroma with bittersweet earthy notes and has a very nice ripe fruit flavour. The effect is powerful and relaxing, providing a long-lasting, psychoactive high.